The reputation Keeley enjoys in the world of guitar effects is one that was built on quality, innovation and interaction with the community. Getting a Keeley effects pedal usually means that you have fine tuned your tone to a point where you are ready to invest in fortifying it. Keeley’s multi-effects pedals are also on that same level of excellence. 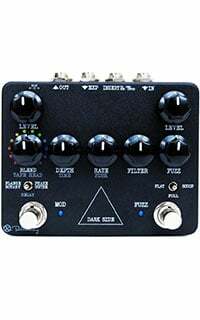 Dark Side Workstation comes across as a fairly simple looking pedal however it is packed with so much versatility and such a great performance. There is absolutely nothing simple about it. 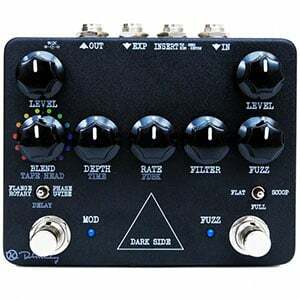 As a matter of fact, Dark Side Workstation is among the best multi-effect pedals on the market right now. Let’s dig in and find out why. Compared to other multi-effect pedals on the market, at least those which share a similar form factor, Dark Side Workstation comes across are rather busy. The design is as simple as it gets – a black box with a number of knobs barely any graphical enhancements. After all, Keeley is not really known for their flashy graphics. This pedal features a very saturated fuzz that has a pretty old school vibe to it. Next is the modulation cluster that includes a phaser/flanger combo, and lastly there is a complex delay. Dark Side allows you to emulate a variety of niche vintage effects such as the multi-head tape delay or a rotary speaker effect. These are definitely not the type of features you see every day. As we have mentioned before, Keeley Dark Side Workstation comes with a fairly busy looking control interface. Knobs are densely laid out across the face of the pedal, but each one is very clearly marked. There are also several switches aside from the two main footswitches. 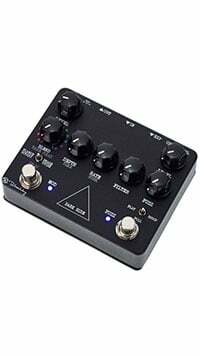 In a darker environment, you might have trouble making quick adjustments, but otherwise it is a fairly intuitive pedal to use. Keeley’s policy was always to give the user all the means necessary to build a tone, which sometimes mean that there is quite a lot of knobs to deal with. Some will appreciate this approach, others may not. However, the performance is something that you just can’t ignore. When it comes to performance, the fuzz is definitely the dominating effect of the bunch. To some, it is exactly what a proper fuzz is supposed to be – clear in the core but chaotic on the outsides. We tend to agree. With the level of tone shaping this pedal allows for, there is no shortage of variations even for something as simple as fuzz. Moving on to modulation and delay, we find a pretty complex set of abilities that are so rare these days. You can sit down and play with various settings for days before you start hearing repeating tone shapes. From a purely conservative point of view, modulation and delay are pretty impressive. Whether you are in search of a good boutique pedal that brings some versatility at a reasonable price, or you’re after a very specific type of tone, Keeley is one brand that you can always turn to. Their Dark Side Workstation brings a pretty unique bundle of effects and different flavors. It does come at a price, but one that is well worth dealing with for the type of experience you get. For more info about the Keeley Dark Side Workstation, click here.